Troop 50 took a ride down the Chattahoochee River today during a rafting adventure on the new Columbus whitewater course. 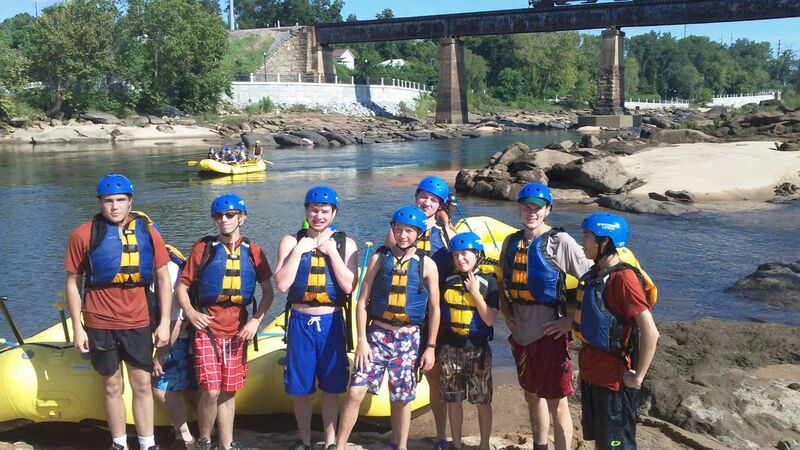 Fourteen scouts and leaders from the troop loaded up this morning for the short ride to Phenix City and the headquarters of the Chattahoochee Whitewater Express. After donning our life jackets and helmets, we endured the obligatory safety briefing and headed out aboard a school bus bound for the 'hooch. The troop was divided among three rafts as we began our float. Following the first set of rapids, we abandoned the rafts and were allowed to lazily float along in our life jackets down a narrow side channel of the river. Upon returning to the rafts, we ran several more rapids before coming to the seemingly treacherous Cutbait rapid. Today, it was running as a Class III rapid, although during a high water release from the dam, it can be a much more interesting Class IV. Either way, it made for a thrilling ride. As we came towards the end of our journey, most everyone abandoned the boats for another swim in the river. After the bus returned us to the rafting company headquarters, we were treated to complimentary cake and drinks. Today, the company was celebrating having served its 10,000 customer since the whitewater course opened at the beginning of the summer. After changing into dry clothes, we headed over to the park at Lakebottom for a picnic lunch. The scouts even expended some more energy with a game of football before the return to Auburn. Although not as scenic as the Nantahala or the Ocoee Rivers, the Chattahoochee has the advantage of proximity as opposed to a five hour drive to North Carolina. The consensus seemed to be that it was a fun adventure for a summer Saturday.